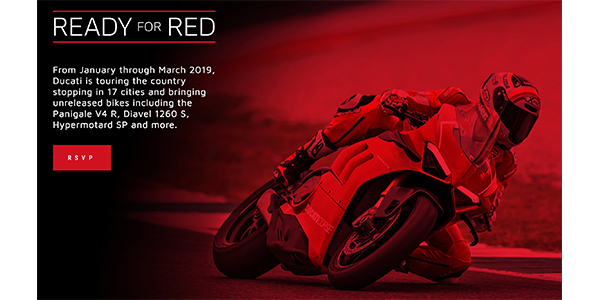 Beginning this Friday, Jan. 18, Ducati North America will be hitting the road with a distinctive selection of their 2019 models, including the world’s most powerful production motorcycle, the Panigale V4 R. The “Ready For Red” tour will share the Italian brand’s technological and performance innovation with audiences across the United States with 17 stops in major metropolitan areas throughout the nation. Guests will have the chance to mingle with Ducatisti in a fun atmosphere while experiencing a diverse product lineup representing the expansive Ducati Worlds that range from racetrack, travel, lifestyle and aport with the scrambler Ducati brand rounding out the experience. In addition to the incomparable Panigale V4 R, other models scheduled to be on-site at the events will include the brand new Hypermotard 950 and 950 SP, Multistrada 1260 Enduro and Multistrada 950 S, Diavel 1260 S and the Scrambler Café Racer, Scrambler Desert Sled, as well as the Scrambler Full Throttle.